Six resin parts and one pre-cut paint mask. Superb quality overall, with separate wheel hubs to ease painting. These are excellent replacement wheels, which seem just a little ahead of the competition in all respects. A modest premium over other brands reflects this; but to equip one model we are still only talking very small change indeed – Definitely recommended. For me, Eduard is a brand name that has become synonymous with superb quality and value for money. Their new Brassin range looks set to continue in this vein. 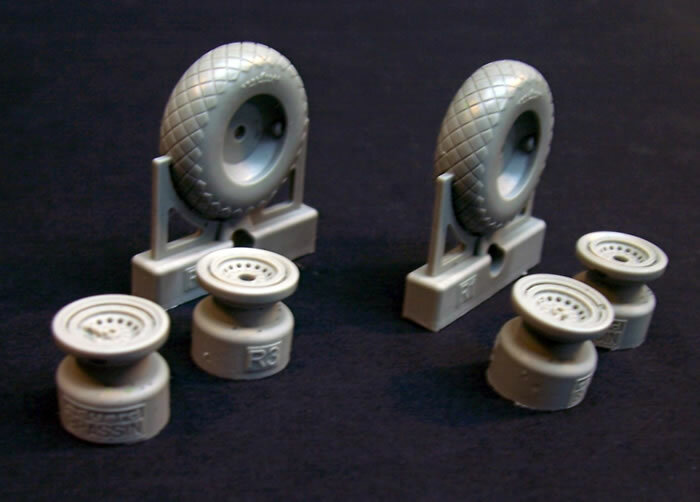 There are several brands of replacement resin B-17 wheels in 1/72-scale, and some are very good. You could be forgiven for wondering if we need more options and improved rendering. Eduard obviously thought there was room for improvement, and I think they found it. 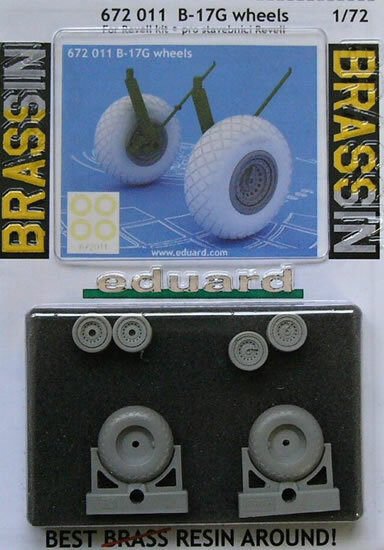 Eduard’s wheels are specified for the Revell’s new B-17G, but would obviously suit other brand kits as well. They come attractively packaged in a blister pack with sponge cushioning. Very clear instructions are included, with colour call-outs are cross-referenced to the Gunze Aqueous, Mr Color, and Mr Metal Colour paint ranges. The Pour stubs attach to the tyres at only three small points despite appearing to run around half the circumference of the tyres at first glance. The quality of casting is exquisite, with diamond block tread on the tyres, along with “Goodyear” logos on the sidewalls. There is also a wealth of detail on the wheel hubs. 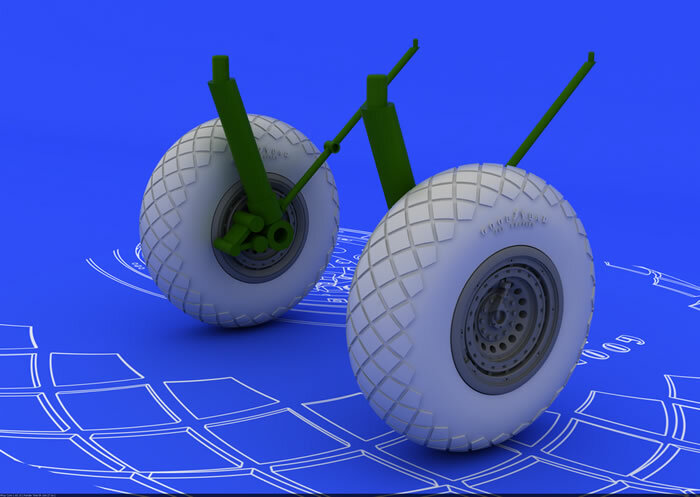 The tyres are not weighted, which is fine by me, and can be flattened slightly to simulate some weight bearing on them. 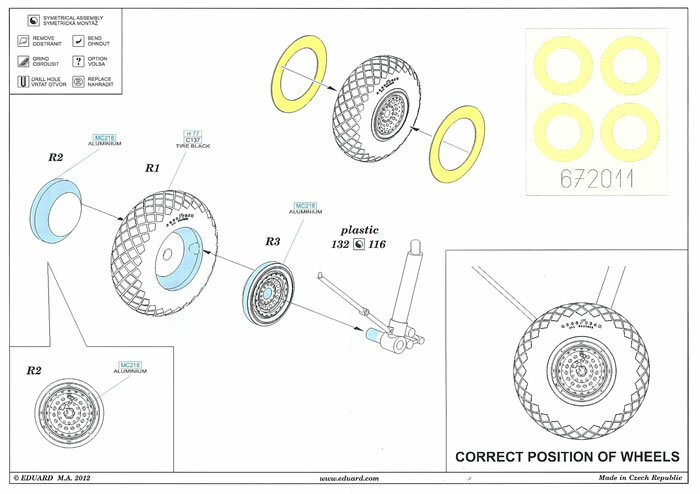 The front and rear wheel-hub faces are cast separately from the tyres, which will assist painting immensely. However, still included are pre-cut paint masks should you wish to assemble the wheels and tyres before painting. The tyres are also keyed to indents in the inside face of the hubs to ensure both sides of the wheel are correctly aligned to one-another. The combination of top-quality packaging, superb detail rendition, separate hubs, and paint masks make Eduard’s B-17G wheels the best of the brands I am familiar with. Eduard’s wheels have a close-run advantage compared to the best of the other brands. Perhaps only the more discriminating will opt for them, as top quality in this case carries with it a price premium of around 25%. However, this is only a very small cost in reality as they are low-cost items to begin with. I leave it to the reader to judge overall value in this case. These are excellent replacement wheels, which seem just a little ahead of the best competition in all respects. A modest premium over other brands reflects this; but to equip one model we are still only talking very small change indeed – Definitely recommended.